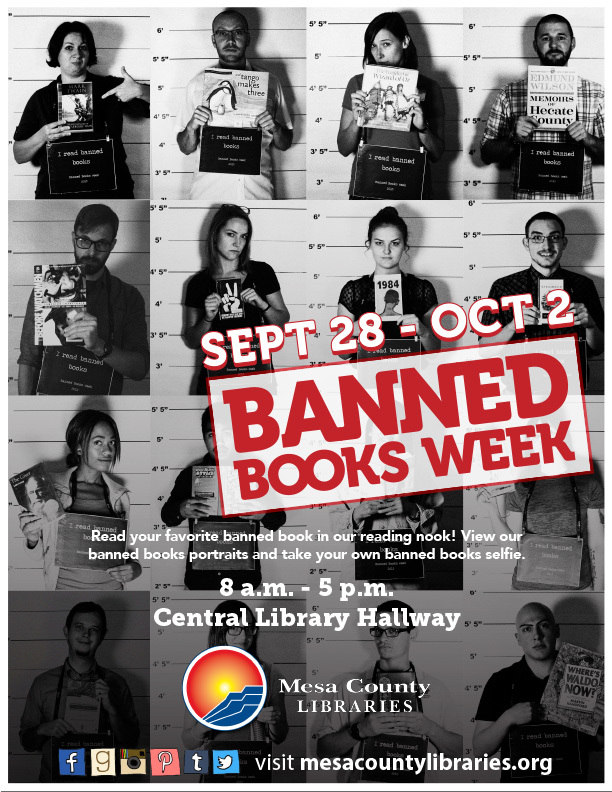 We are celebrating Banned Books Week this entire week from September 28 through October 2! What is Banned Books Week? It is an annual celebration of the freedom to read! Libraries, schools, and bookstores across the country and across the world highlight titles that have been frequently challenged or banned. In 2015 the week is focused on Young Adult books. American Library Association’s Office for Intellectual Freedom publish an annual list of the most frequently challenged titles. In 2014, six of the top ten were Young Adult titles. These include Sherman Alexie’s National Book Award–winning The Absolutely True Diary of a Part-Time Indian and Raina Telgemeier’s graphic novel Drama. Other frequently banned or challenged Young Adult books can be found in our catalog. “This Banned Books Week is a call to action, to remind everyone that young people need to be allowed the freedom to read widely, to read books that are relevant for them, and to be able to make their own reading choices,” says Platt. Take the opportunity this week to discover a new book that challenges you or revisit an old favorite in our Banned Books reading nook. Take a selfie with your favorite banned book and share it with your friends and family. Drop by the library between the hours of 9 a.m.-5 p.m. this week to join the celebration! Posted in General, Programs/Classes, Teens.